Gianni Brunelli, a man of many interests, established Siena's Osteria Le Logge (now one of the top restaurants of the city) in 1977. In 1987, he returned to Montalcino and purchased 'Le Chiuse di Sotto,' an estate that had belonged to his father Dino, with 2ha of vineyards standing at 200m above sea level in the northern part of the region. Brunelli replanted most of the vines in 1989, but left untouched a small plot of older holdings dating back to his father's original 1947 plantings. After Gianni passed away in 2008, his wife Laura, who was already working at the estate, took the reins along with her brother, Adriano. 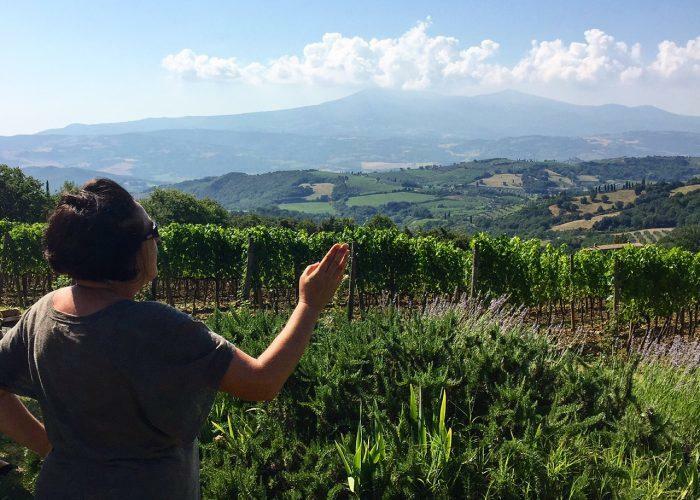 A few years ago, the estate expanded with the purchase of the 'Podernovone' vineyard, located further south in Montalcino. The 4ha property sits at 350m above sea level and has a magnificent view of Monte Amiata. Podernovone's soil is comprised of calcareous-marl and schist, which reflects light and heat, leading to a warmer site. 'Le Chiuse di Sotto,' a 2ha plot, is cool and airy, bringing bright acidity to the blend. As with Pacenti, the Brunelli's vineyard sites allow them to blend north and south to achieve great balance, no matter what the vintage brings.